Just a few weeks ago, something incredible happened. On an otherwise ordinary day in Venezuela, a pitcher named Rick Teasley became the first person to ever strike out Willians Astudillo twice in a game. Teasley is a former Rays draft pick who’s played baseball all over the globe, and Ben Lindbergh and I were delighted to chat with him for the Effectively Wild podcast. He remembered the pitches he threw to Astudillo with great detail. Those are pitches one wouldn’t soon forget. The Venezuelan winter league regular season is now over. Astudillo wound up fourth in the league in plate appearances, with 261. Against Teasley, that one evening, he struck out two times. Against everybody else, every other evening, he struck out two times. Willians Astudillo has completed another regular season. He finished with four strikeouts. And it only gets better from there. Con los números en la mano, ¿quién debe ser el Jugador Más Valioso de la temporada? ?? Creo que para mí hoy el Jugador Más Valioso de la LVBP está entre Franklin Barreto y Willians Astudillo. Lo de Delmon Young es superlativo, pero aquellos aportan también a la defensiva. Si fue la postura que uno defendió con J.D Martinez, lo lógico es ser coherente. Astudillo tiene 4 ponches en más de 248 turnos en la LVBP con .880 de OPS. Por mi que le den el MVP, la madrina y el arroz que queda pegado de la olla. It’s Astudillo, in the place where he belongs. 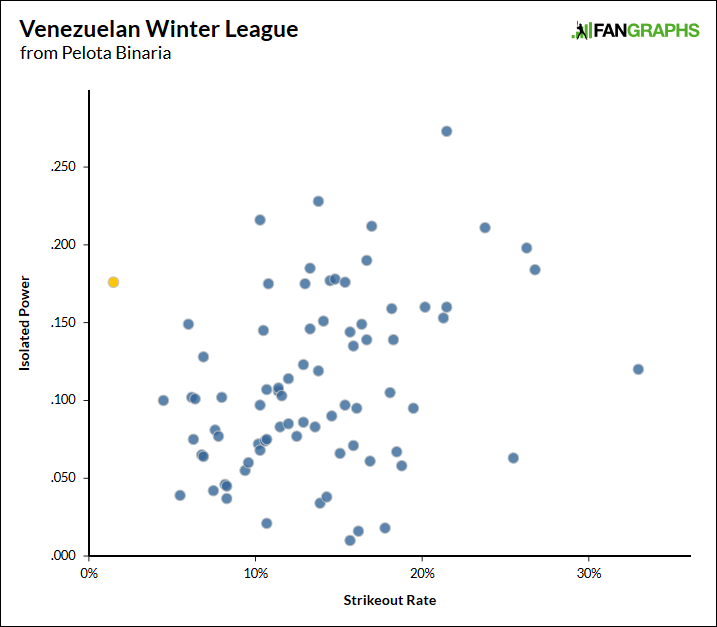 Now, the pitching in Venezuela isn’t nearly as good as the pitching in the majors, and the league-wide strikeout rate is lower than what we see in the bigs. But first place is first place, and Astudillo’s strikeout rate up there is just a third of the next-lowest in the table. There’s a separation of three percentage points between Astudillo and Vargas. There’s a separation of 2.4 points between Vargas and Martinez, in tenth. Everywhere he plays, Astudillo’s contact hitting is exceptional. He did this last winter in Venezuela, too. Putting everything in play is one thing. Putting the ball in play with authority is another. Astudillo has hit the ball, and he’s hit the ball pretty hard, and although it’s not as if we get access to any kind of LVBP Statcast metrics, it’s easy enough to identify a clear sign of progress. During those first four years, Astudillo hit two home runs. Over his next three years of playing, he hit 15 home runs. Over just the past two years, he’s hit 35 home runs, in hundreds fewer plate appearances. That’s happened despite Astudillo going up against some of his toughest competition. He was, of course, successful in his brief big-league stint with the Twins. It’s fun to look at the ISO and the K% columns; Astudillo has recently more than doubled his power output, without sacrificing any of his contact. I don’t know exactly how he’s done it, and I don’t know if he’s made any kind of mechanical change, but generally speaking, there’s an inverse relationship between power and contact. It’s hard to improve one without making the other one worse. Astudillo only continues to amaze. There’s very little left for him to prove. There’s clearly nothing left to prove in Venezuela. It was wonderful to see Astudillo break through last season, but it remains unclear how the Twins might intend to use him moving forward. At catcher, Jason Castro should be healthy again. At DH, the Twins added Nelson Cruz. At first base, they have C.J. Cron and Tyler Austin. At third base, they have Miguel Sano. In left field, they have Eddie Rosario. The path isn’t all that clear, but now, more than ever, Astudillo appears deserving of regular playing time. It’s not simply that he’s done well in Venezuela. Delmon Young has done well in Venezuela. It’s Venezuela. What’s important is that Astudillo has proven himself everywhere. He still makes constant contact, and now he’s added some power, to go with his ability to catch. All the recent numbers point in one direction. Astudillo might well end up winning the Venezuelan MVP award. One should hope he’s also awarded a major-league salary some months after that. Somehow, he’s only made himself all the more interesting, and he was already one of the most interesting players in the world. We hoped you liked reading Willians Astudillo Is an MVP Candidate by Jeff Sullivan!